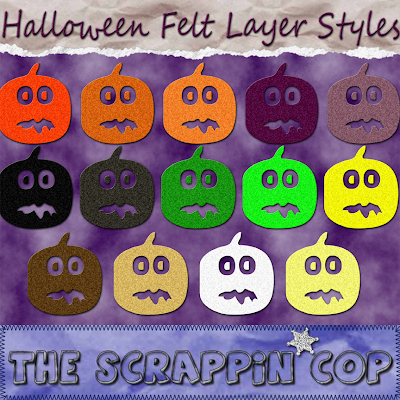 The Scrappin Cop: Halloween Colors CU Felt Layer Style .asl File! Halloween Colors CU Felt Layer Style .asl File! I tweaked the settings a little for my felt layer style and made a new layer style in some Halloween colors! All colors in the preview are included in the Photoshop .asl file. 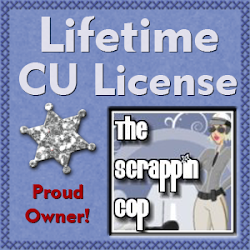 They were created in CS3 so hopefully they will work in your version of PS or PSE! I am working on an idea I have for some PS brushes, just have to get the details worked out. I am slowly but surely getting the hang of my new program, and I love it! Now if I can figure out InDesign and Illustrator I would be all set! Yay, these work in Elements 4! Thank you so much...I just love both sets!!! Thank you! Your blog post will be advertised on the DigiFree Digital Scrapbooking Freebie search engine today (look for timestamp: 24 Aug [LA 03:24am, NY 05:24am, UK 10:24am, OZ 08:24pm] ). he he these pumpkin faces are very cute. 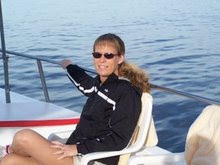 Thank you so much for sharing these styles. I cannot wait to try them out. I just picked up all of your halloween creatures and felt layer styles. Thanks! Love the felt styles! Thank you! Thanks so much! I cant wait to work with the felt! Useful and pretty - thanks!